Today sees the launch of silvatimber.co.uk the online shop for the UK’s leading supplier of speciality timber products, wood finishes and fixings. The website sells the full range of products Silva have to offer including Decking, Shingles & Shakes, Cladding and Fencing. Designed and developed by igoo the shop is built upon the magento commerce platform and is the fifth large scale Magento development that the igoo team has undertaken this year. The website includes detailed product pages with full focus on the quality of the wood supplied, an in depth resource and case study section along with an up to date blogging/news facility. The website offers on-site payment with SSL level security for a quick and safe checkout. 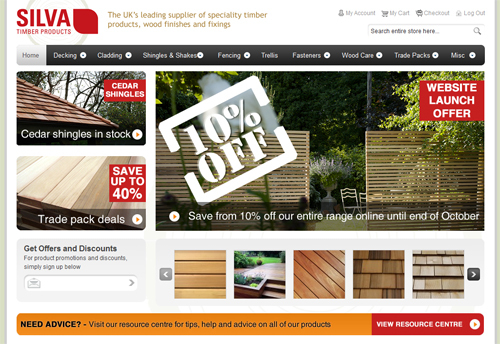 Visit silvatimber for timber decking, cladding, shingles & shakes and fencing products.